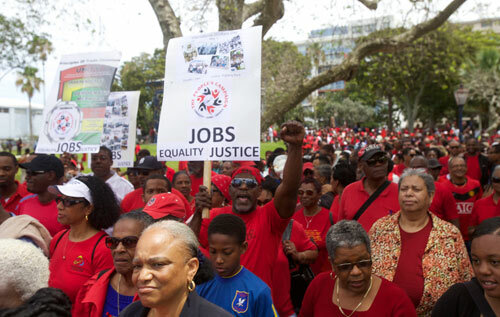 On May 1, commonly known as May Day or International Workers Day, the People’s Campaign for Equality, Jobs and Justice organized and successfully executed the largest display of civic engagement outside of an election that Bermudians have seen during the last three decades. The People’s Campaign, a coalition of concerned people of goodwill who banded together to give voice to the conditions of the country, were able to motivate and inspire individuals to ignite their civic responsibility. We thank those persons who attended the community meetings, and participated in the rally and march. As a result of your efforts, we were able to present the Government and Loyal Opposition with a People’s Manifesto that outlined a standard of expectations outlined by the people of Bermuda. Through organizational discipline, the organizers of the campaign were able to control the message and dialogue held during the community meetings so that the campaign remained both non-political and non-racial. The campaign message was primarily focused on the issues surrounding equality, jobs and justice. The People’s Campaign, out of a shared love and concern for the country, felt the need to speak in an effort to reset the moral compass of the island and its leaders around a set of core issues. • The Government is the servant of the people and the people of Bermuda entrust the Government to ensure that all of its people are treated equally, have equal opportunities, and have equal protection under the law. These core beliefs are affirmed by the people of Bermuda and form the foundation of the People’s Campaign; it is the absence of these principles as goals in the political process that is the primary reason for the evolution of the People’s Campaign. Some people may want to distract the public from the issues that have been raised by the People’s Campaign by purposely attempting to mislead individuals to believe that the People’s Campaign was somehow a front for other ulterior motives. As a member of the organizing committee for this campaign, let me say that the People’s Campaign is about the people of Bermuda and what they are experiencing. Members of parliament of both the Progressive Labour Party and the One Bermuda Alliance should be concerned that within a two-week period thousands of individuals supported the People’s Campaign and demanded that those individuals in the House of Assembly put the people first and make their issues a priority. Naturally, the OBA will feel the greatest pressure of this movement as they are the Government of the day and will have the primary responsibility to address the concerns of the people. However, the PLP has to be equally concerned that a portion of their constituents are suffering and are resonating the ideals of the People’s Campaign centred around equality, jobs and justice. This should force the party to rethink its current theme of ‘Do for Self’. As the campaign moves out of its first phase and develops into a more strategic phase, the People’s Campaign will seek to encourage the Government to engage in dialogue through a process of deliberative democracy. Deliberative democracy rests on the core notion of citizens and their representatives deliberating about public problems and solutions under conditions that are conductive to reasoned reflection and refined public judgment; a mutual willingness to understand the values, perspectives in light of a joint search for common interests and mutually acceptable solutions. In addition, the People’s Campaign will seek to assess the Government and the Opposition through public evaluations. Public evaluation will allow the People’s Campaign to assess how effective those who sit in the House of Parliament are in addressing the issues raised by the people. In closing, the people of Bermuda are entitled to expect that those who are entrusted to lead them will be guided by the will of the people, and make decisions based upon priorities that are consistent with the expectations, hopes and aspirations of all of the people.